Veeam Explorer for Microsoft Exchange allows you to add Microsoft Office 365 organization backups located on server providers servers. Both Veeam Explorer for Microsoft Exchange and Veeam Backup & Replication must be installed on the same machine. At least one service provider must be added to Veeam Backup & Replication, as described in Connecting to Service Providers. From the Start menu, launch Veeam Explorer for Microsoft Exchange. 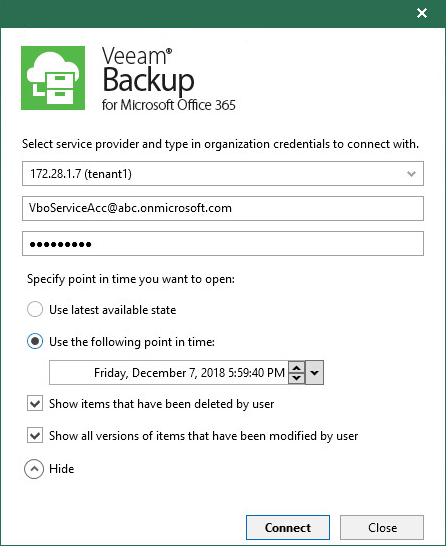 On the toolbar, click Add Store > Veeam Backup for Microsoft Office 365 Service Provider or use the corresponding context menu command. In the drop-down menu, select a tenant account to which you want to connect. The list of available tenants depends on added service providers. Provide your Microsoft Office 365 organization credentials. You can also select a point-in-time state as of which you want to load an organization database. For more information, see Specifying Point in Time. When you connect to the service provider server, you may want to select a particular state as of which to add an organization database to the Veeam Explorer for Microsoft Exchange scope. 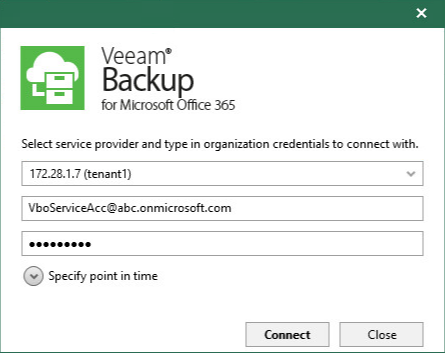 After you select Veeam Backup for Microsoft Office 365 Service Provider and provide required credentials, click Specify point in time. Use latest available state. To load data as of the latest backup state. Use the following point in time. To load data as of the selected point in time. To select a state, use the calendar control. To load items that have been deleted by the user, select Show items that have been deleted by user. To load all versions of items that have been modified by the user, select Show all versions of items that have been modified by user.